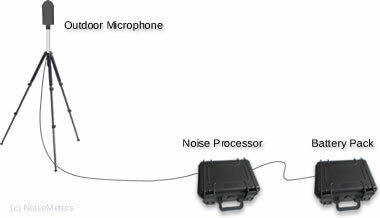 The EM2010P Portable Environmental Noise Monitor is for temporary installations, although the noise processor can be removed from the case and mounted indoors on a wall. For a more permanent installation with power available, please see the EM2010 Environmental Noise Monitor. The EM2010P consists of two weatherproof cases and a tripod. One case contains the noise processing unit and wireless communication devices. It also carries the microphone and cables. The second case contains the 10-day rechargeable battery. This is in a second case to ease carrying and so that it can be easily swapped out in the field without having to disturb the noise processor. This is not only convenient but avoids opening the main case in poor weather conditions. The EM2010P units connect to the Internet using the mobile phone network. 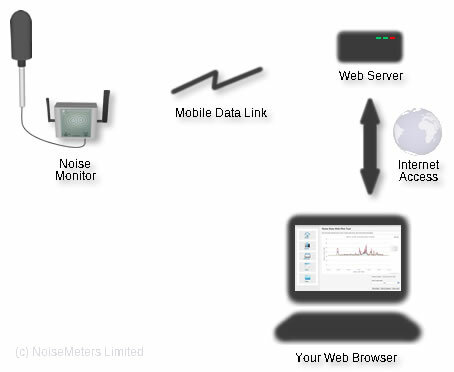 The noise monitor regularly uploads measurements to a web server, where they can be viewed using a standard web browser. It also includes a WiFi connection for on-site connections and unit configuration. No, the EM2010P/G and EM2010P/GA come complete and ready to go, as long as it is in a region with a mobile phone signal. The price includes the modem (built in to the noise processor box) and SIM. The price for these units also includes the first year of your contract, which covers the use of the installed SIM (no extra data charges) and access to the web server to view the reports. 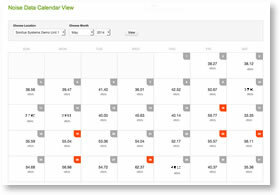 After the first year, the cost to renew this contract is in the Ordering box above. To protect against inflation we can provide you with a multi-year contract from the start, otherwise renewing can be carried out when the time comes. The EM2010P logs the noise measurements throughout the day, usually storing the Leq and the L90 (along with a few other parameters) every five minutes. The monitor connects to the Internet every 15 minutes using the built-in modem and antenna and sends the latest measurements to the server. For noise compliance monitoring it can be essential to know about any problems as they occur, rather than looking at a report a few days later. The EM2010 noise monitor and reporting system can be configured to send you a text message or an email alert when an LAeq limit has been exceeded. The EM2010P/G and EM2010P/GA include everything you need to deploy the noise monitor and make unattended measurements for one week before recharging or replacing the battery pack. The measurements will start automatically and be uploaded to the web server as they become available. The microphone comes fitted with weather protection (rain, snow, etc) and a wind shield. It mounts on a stainless steel post which in turn fits on the tripod. A 10m cable connects the microphone back to the noise processor. This cable can be extended up to 30m using standard RG-174 coaxial cable and suitable connectors. The batteries are contained in a separate carrying case. This is to make transport easier (batteries are heavy) and to give the option of multiple batteries to swap in the field without opening the noise processor case. The battery pack connects to the processor case, and noise measurement will start automatically when the power is applied. With a full charge it has sufficient power to run the noise processor and mobile internet access for at least ten days. The following items are available as options for the EM2010P Portable Noise Monitor. Those marked [Factory Option] must be carried out at the time of manufacture, or the equipment will have to be returned for upgrade. Other options can be added at any time. The standard EM2010P meets the sound level meter standard IEC 61672 to Class 2 and ANSI S1.4 to Type 2. If your regulations demand the use of a Class 1 or Type 1 system then you should add EM2010UPG1 option to your order. As the whole EM2010P measurement chain meets Class 1, the main change is the microphone capsule. Operating and installing the unit are identical to the Class 2 version. The standard EM2010P/G and EM2010P/GA kits come with one battery pack. An additional pack can be added, which can be swapped in the field, reducing downtime. The EMPP1240 battery pack is supplied in a weatherproof carrying case, similar to the case that carries the noise processor. This allows for easy transport and the ability to swap batteries without opening the Noise Processor - appreciated on rainy days. A charger is also included. 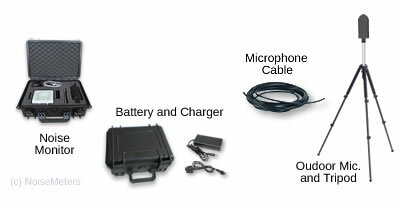 The EM2010 is supplied with a 3m microphone cable. This can be extended to 10m using standard 50 ohm RG-174 coaxial cable.